People ask the hardest questions sometimes. One of the hardest to answer is "Can you describe a typical unschooling day?" Sometimes I've said "like the best Saturdays you remember from when you were a child." Some Saturdays or Sundays were taken over by relatives or emergencies or mechanical failures or illness. Those days happen, when the sun seems to go down before people get to do what they had planned. And some days are just too perfect to tell, for fear of intimidating the audience with a fluke of an incredibly rich, productive and photogenic day. I would like to recount an actual recent incident, and how a string of events led up to an unschooling day. 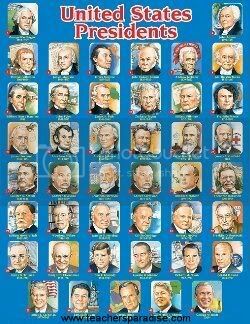 Three years or so ago I bought a book of biographies of U.S. presidents. It's been here and there in the house, but a few months ago it was in the kitchen. Marty picked it up and commented that some presidents only had half a page. And some had funny names he had never heard, like "Millard Fillmore." The book came to be leaning on the side of the stairs up to the library, for re-shelving. Weeks passed. Last fall, totally unrelated to the book on presidents, I ordered a presidential timeline poster from C-Span. Someone on a message board had mentioned that it was available free to teachers, so I ordered one, took a look, and left it on my desk. Time passed. At Thanksgiving dinner at the in-laws', I mentioned the chart. I was the only one in the family who had seen it. The wall it would fit on already had some Christmas cards up. I wasn't in a hurry anyway (which was good, because I had a broken leg). One day in February, Holly said, "We should play Encore." Encore is a singing and trivia game we bought at a thrift store long ago and have played lots. Teams try to sing phrases from songs containing a certain word or topic, like "cars," or the word "little." Holly said, "We should sing songs about presidents. I know three!" Other than the vague thought that somewhere in the Disney song "Davy Crocket" a president might have been named, I couldn't think of one. I need to back up about twelve hours. I had read myself to sleep with an article on The Simpsons in which the author wrote, "There are reasons why the U.S. Poet Laureate, Billy Collins, told me The Simpsons is 'the only reason I own a TV'." And the morning after that (the morning of the typical day) Holly had said, "Names on The Simpsons are really different. Like 'Milhous'." I had told her that was the middle name of Richard Milhous Nixon, who was president not so long ago. So to win her round of "Encore," Holly said she could cite the Animaniacs song on the presidents, and one from The Simpsons called "We are the Mediocre Presidents." Marty came in just as Holly was singing "Oh do you know George Washington," to the tune of "The Muffin Man." "That's not a song," said Holly's worldly, song-filled fourteen-year-old brother. "Yes it is. It's on a tape at Genna Miura's house!" Okay. Holly three points. Me, Marty and Davy Crockett, zero. Holly went back to singing "We are the Mediocre Presidents" and I said, "Marty says that in that book on presidents, some just have half a page. They might be the same guys." Holly got the book to see if it could be a simple truth that some presidents had only been half-page presidents. "FDR. Is he the guy in Annie?" "This guy looks like he's from Texas." "Lyndon Johnson was the only one really from Texas," I said, and then muttered a bit about George Bush Sr. and trailed off saying I guess maybe George W. might be an actual Texan. Holly wasn't listening anymore. She was looking at a cartoon illustration of Theodore Roosevelt. He's the one she had thought looked like a Texan, from the picture. I checked the fine print for her. "Oh! Born in New York City, but he was into horses and such." "Wow. That's a lot of firsts!" When was he president? The book didn't say. TIME TO UNVEIL THE C-SPAN CHART! Marty helped me tape it up. Holly and Marty started figuring out how to interpret the graph, what the blocks of color indicated, how easily you could tell who was president when each other president was born, who had and hadn't been in the military, who had been legislators and governors. Kirby heard them and came out to see what the excitement was. I just kept doing what I was doing across the wall in the kitchen, knowing Marty was fully capable of answering any questions Holly might have about the chart. Holly said, "Can we leave this up until tomorrow so I can answer questions about my birthday?" Oh yeah! That's where this started. Holly had made a beard of the cut off rim of a paper plate, put it on herself and said, "I'm Abraham Lincoln. My birthday is tomorrow." But that's not where it started. It started because she was reading the calendar to me and asked what "A-D-H-A" spelled. I said it wasn't a word. She said it HAD to be a word, because it was on the calendar. I said "Well it's not an English word." It was hours later when I went and read "(Eid) al Adha." Someday I'll look it up and tell her what it is, but I didn't know myself, and the river flowed on. We'll pass that point again next February, or sooner. Later in the day Marty was back at the chart, and declared that Reagan had been a bum, but George Bush was NOT a bum. I went to see upon what this "bum" rating was being based. The chart easily showed that Reagan was much older than Bush when they both joined the military at the same time. I ran my finger across the whole chart to show Marty that John F. Kennedy, Richard Nixon and Gerald Ford had all joined then too. Dwight Eisenhower and Lyndon Johnson were already in. What was the big occasion? Marty ran his finger back up to the pictures and dates. World War II. Both his grandfathers had joined too. Most of the young men in the country had joined. Holly's interest in music from The Simpsons led Marty to a profound realization about WWII. I wasn't surprised. I didn't plan it, but I was open to it and I expect other connections and discoveries of a similar nature to happen three or four times this week. So "a typical unschooling day" for us involves connections being made to things someone learned an hour or a week or many seasons before. That chart of presidents will be referred to and remembered for years, even after it's no longer on the wall. In the whole unfolding, a Simpsons song Holly learned from a CD was no more or less valuable than a book about presidents, or a free wall chart from C-Span, or knowing that the story of the musical Annie is set during the Depression when Franklin Roosevelt (not Theodore, who's not from Texas) was president. It all came together to help Holly build the structure with which she will tie in future bits about not just American presidents, but all other connections historical, geographical, political and social. My children have never asked, "Do we have to learn this?" They don't have to learn anything. So everything is equally fun for them. The joy of unexpected discovery is the substance of a typical unschooling day.